If you have stumbled across this sight, you are probably a pipe smoker. And if I had to take another guess, I would say that you are not some connoisseur or certified tobacconist. Like me, you just want to smoke delicious tobacco in one of your pipes. It is easy to get bogged down with complex jargon like balkan, flue-cured, kabakolak, and other terms found on a tin’s description. But to be honest, most of us have no clue what these mean. Perhaps if you were a chemist, or an amateur tobacco blender, then you may be able to translate these into what it actually means for flavor and performance. The pipe smoking community needs a reliable and honest source for tobacco reviews. I am no tobacco sommelier. What I am is a regular guy who can objectively describe a blend. I have experience working on the frontline of the tobacco retail market. As a tobacconist Tinderbox, I know what smokers are looking for and what they care about. I want to help people. I am currently a student in a Masters of Theology and Christian Leadership program and work at a church in Winston Salem, NC. The love of Christ is motivates me to help others. There are not many unbiased pipe tobacco sources out there, let alone in depth tobacco reviews. It seems every site is trying to sell a product by any means. While I contribute to a site, TobaccoPipes.com, I have the freedom to be completely honest in my reviews. It is fun to write. This is my hobby. My hope is to describe in detail aspects of these blends that you cannot possibly know unless you intensely smoke it. This blog provides in depth information, but by no means a comprehensive breakdown. Just my reactions, feelings, and opinions on each blend. You can use this blog as a resource for researching new tobaccos, as entertainment when you are smoking, or even as a comparative tool. 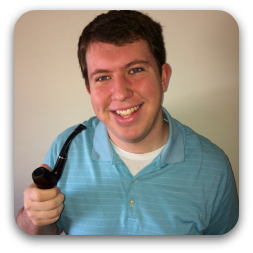 I sincerely hope this blog becomes a valuable resource for you on your pipe smoking journey! I’m Larry Rubin, one of the guys on Tobacco Pipes “Spotlight”. My picture is next to yours. Got a question. Of the Oriental spice tobaccos commonly found in English blends, which ones would you say are the mildest ? Many times in blend descriptions they state many different names but I prefer to avoid those that are too strong, spicy or peppery since they don’t agree with my palate or nose. After smoking pipes for 55 years I’m not looking for a kick in the head anymore, but I do enjoy a softer type of English w/o any Perique or heavy latakia. Bet you enjoyed being interviewed by Renia’…I did. She and Ben are good folks. That is a fantastic question, and I believe a lot of people struggle with this. I will give you my best answer an personal opinion and hopefully that will be satisfactory. From my own personal experience, almost all Turkish (Oriental) tobacco comes with a high level of spice. I do not believe you could get an Oriental that is not spicy. Sure some will be more and less spicy, but because Oriental is defined my “Sweet & Spicy”, there will always be some degree of spice. What I suggest is that when smoking Orientals look at the blend info and the tobacco combinations. You are right: Oriental paired with Latakia or Perique is going to be much more spicy because the components of Lat. and Per. will not balance and will agitate the palate causing you to be more sensitive to spice. Look for blends that have a lot of Burley, maybe some Virginia, mixed with the Orientals. I believe the sweetness of the Burley will compensate and balance your palate out more and will help keep you from being “kicked in the head”. Of course be aware that all blends are different. Some might still be spicy. So read the reviews. I imagine that if you have smoked for 55 years, you will tend to agree with a lot of reviews out there. P.S., the interview with Renia was indeed a blast! One of the reasons I’ve continued filling all my pipe bowls for so many years is in fact because of all the hundreds of blends and varieties that have stayed around or became new entries for the user to try. It’s always fun to open a new blend for the first time and decide which of my pipes I should try it in. More than not I reject most of them after the first try if I find them too deadly for my taste or too polluting to the environment. They do get recorded into my logbook nevertheless. I find that straight burleys and virginias are pretty consistent from brand to brand but that the English’s as you said can run in many different directions depending on what percentage of each leaf is used and which is forward dominant. So, and as you also said, the inherent mild or strong personality of any given leaf can be enjoyable in one blend and not so in another. That’s the intrigue and mystique I enjoy in discovering pipe tobaccos. I stay away from brands that use prop/glycol. I don’t see why they use it and think it should be ruled against they way the Germans do. celebrate how strong and thick the toppings are in what they puff on and lose out on the real essence of pure tobacco the way it was originally intended way back when……just my opinion. For the record my pipe collection is almost complete and should stand at a total of 64 this coming summer. It is so nice to see a quality young man of faith and character take the time to help others get started in this great hobby. Thank you for the encouragement! It’s a great hobby and I just hope to give people another resource. i have a question related to blending . Thanks for the question. First and foremost, I am not an expert blender. While I can have a solid opinion, there may very well be someone out there who can correct me. Since it is cigarette tobacco you are talking about, I imagine that it is pretty dry tobacco. I would at least make sure that I mix it with a blend that is a little moist, and is definitely not dry itself. What I would do is mix it with some golden virginia. I really like golden Virginia, its subtle sweetness and its ability to be conformed. I think if you mixed in either a little Cavendish to make it sweeter or Lat/Per to stouten it up it will make a good blend. So I guess I am suggesting a 50% Oriental blend, 30% Golden Virginia, then 20% Cavendish or Lat/Per. I would try making a 3 or 4oz sample of this and seeing if it works well. I hope this helps you out some. Please keep me posted on what you try and how it works!